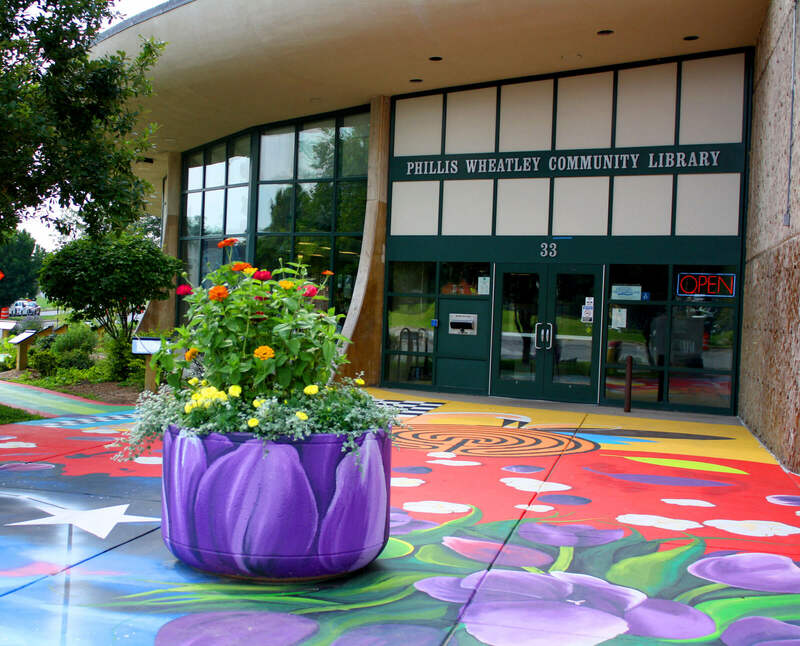 The Phillis Wheatley Community Library is an ultra-modern building designed by architect James H. Johnson. It was built in 1971 and is handicapped accessible. The library is named for Phillis Wheatley (c. 1753 – December 5, 1784). She was the first published African-American woman and first published African-American poet. The library services a predominantly African-American population and the multicultural historic Cornhill neighborhood bordering the library. Closed 4/18/19, 5/17/19, 9/27/19 and 10/18/19 for staff development. “Safe to Be Smart” Program – Activities and services geared toward youth from 3 – 6 pm, or after school. Storywalk – Read and play on playful sidewalks along the way to the library entrance. Our story walk story is changed on a monthly basis with award winning stories and stories written by local school children. Storywalk is accessible even when the library is closed. Public Food Forest Garden – The garden landscape of the library building is comprised of local edible plants and 12 raised bed giving gardens. The community is welcome to help out in the garden on Wednesdays during the growing season and to harvest what grows in the garden. For more information and events check out the Phillis Wheatley Library Public Food Forest Garden group on Facebook. Digital Literacy – Free computer support and computer-related assistance. Learn basic computer skills and how to use Microsoft or Google products. Get assistance creating or updating your resume, applying for jobs or benefits online and much more. This service is provided by Literacy Volunteers of Rochester, Inc.
After school tutoring for children, 1st through 6th grade, is offered 2 days a week, September – June. TASC tutoring is available. Please call the library for dates and times. The Nancy Evelyn Brandon meeting room seats 110 and is frequently used by community groups and other non-profit organizations, who may book the room for free. The room is also available to for-profit organizations, for whom a $30 fee applies. Call staff at (585) 428-8212 for additional details. The Phillis Wheatley Community Library maintains 34 computers with Internet access for adults, young adults, and children. Printing is available from all computers, with color prints at $.50/page, and black and white at $.25 cents/page.